There's nothing that makes me more homesick or proud of New Zealand other than the world premiere of The Hobbit. Please find below, original write-up by eventfinder. Wellington, also known as The Middle of Middle-Earth is planning a blockbuster celebration today for the world premiere of The Hobbit: An Unexpected Journey. Stars and VIPs will walk more than 500 metres of red carpet from Reading Cinemas to The Embassy Theatre, both of which will be screening the film for invited guests today. Pre red-carpet entertainment will begin at 3:00pm and the filmmakers and stars of the film will begin to arrive at 4:30 pm. 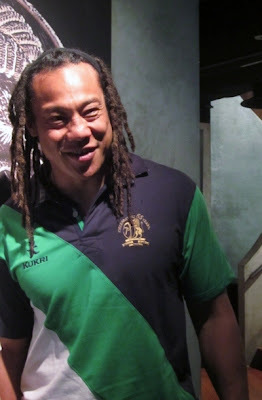 All Black Legend Tana Umaga is in Singapore for of the SCC International Rugby 7's to run a series of coaching clinics for the local rugby players aged 13 to 18. So when I found out he was going to be making an appearence at the Fern and Kiwi, I just had to get down there! Tana is an approachable and down to earth guy.